La Palma is located 2 hours from San Salvador, just shy of Honduras, in the department of Chalatenango. Route is part of Craft and more than 30 years, its population has been producing decorative crafts using pine wood. Lake Ilopango is one of the Lakes most beautiful in the country. It is located in the central zone of the country, 16 miles from the capital. It is an ancient volcano crater, presents depths of up to 230 meters and is excellent for diving. The Sunzal is a paradise for the lovers of surfing and the public in general, thanks to its waves El Sunzal is known internationally. Some specialists in sport catalogued them among the top ten for the practice of sport, thus attracting surfers from around the world. San Andres is a pre-Columbian site El Salvador, whose long occupation began around the year 900 b.C as an agricultural village in the Valley of the Zapotitan Department of La Libertad, this early settlement was vacated by the 250 year cause. The Development Board of Santa Ana was created in 1889 his function was to ensure enlarge and ornament of Santa Ana. Santa Ana’s Development Board start the project of creation of the theatre in Santa Ana, in 2007 met 20 years to be carried out the restoration of the theatre. 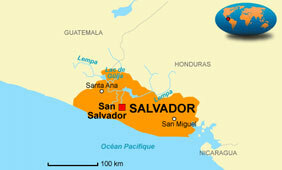 El Salvador is one of the Americas located on the isthmus called Central American republics. And Central America is the territorial Strip which connects North America and South America. El Salvador geographic region is as follows: falls in the Northern Torrid Zone, which determines its more or less warm weather condition throughout the year. In the capital on night there from where to choose. Bars and clubs that offer. El Salvador culture is a mixture of cultures Mayan, Lenca, Nahuat, Ulua, Spanish. In El Salvador is Semidetached monuments and places of historical interest. Corn is the basis of the typical food of El Salvador as its Central American neighbors. © Copyright 2011 Visit El Salvador. All Rights Reserved.